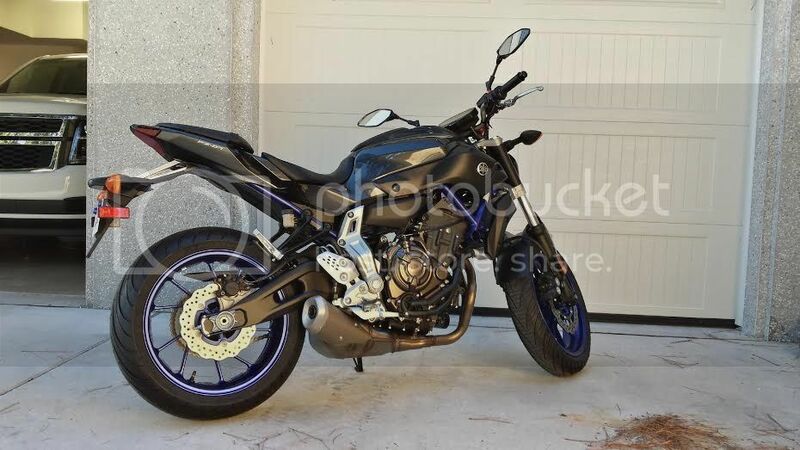 So today, even though I wasnt intending to, I bought my fz. I have wanted one since they came out and today I just went to look at them at the dealer and ended up coming home with one lol. I do NOT regret it, probably the most fun ive ever had on a bike. I picked her up with 1 mile and it was still in the crate when I got there. I have put almost 100 on it just in the last few hours. I have already started ordering parts for it and it hasnt even been 24 hours yet lol. Welcome fzdan! Nice lookin' bike! What part of SC are you from? I live in Greenville, when I'm not on the road for work. There is a Carolina tread pop in there and introduce yourself. Welcome. Congrats on the new bike. I know what you mean about ordering parts as I had almost all the parts that I wanted for my bike ordered within a week of ownership. Have fun. Welcome fzdan! It's fun to hear how much people enjoy this bike when they first ride it. The nice part is... the feeling lasts long after your first ride! Welcome! Most mods are fairly easy to do, so have fun making those mods. Welcome and nice bike. If you can live with the quiet, big scooter sound you can save yourself some money and stress by not going with aftermarket pipes. I live for stress and less money so I did get one for mine. Enjoy! I was in the same position when i got my bike last august. Wanted one since they were released in europe. Saw a red one in my local dealership and bought it the same day despite not intending to. Thanks everybody for the welcome! For the Carolina guy asking where I am at im in Charleston, Mt Pleasant more specifically. And yeah Ive already put on a fender eliminator and I will be ordering exhaust this week. I will probably be going with the m4 to keep cost down a little bit and Im considering ordering the stage 1 kit form dobeck with the ejk tuner along with it. Unfortunately my timing has been terrible this week when I want to go for a ride and its been raining, but the sun is shining today so im gonna take a nice long ride somewhere. Check out the August Giveaway thread under my supporting vendor page. Could win a free set of LED turn signals just for riding your bike!